← Silent in the Grace . . . It seems like a terrible trick when one’s eyesight begins to diminish and fail. And in truth, it is. I can’t think of any of the five senses that one could choose to lose. It seems to me that going blind is the worst. But I choose to be brave over choosing to be fearful about losing my eyesight. This doesn’t mean I’m some huge hero. It just means that I choose to think differently. There have been times in the last seven years when I was quite fearful of going blind. Now, as I make steps to go to the department for the Blind and Visually Impaired in Richmond, Virginia in October, to get help, all I can think about are the students I taught and the readers who have read my books. I think of the fact that I was gifted for so many years to spread the love of teaching and to see words and just speak them and translate them to people who needed me. So, I use this blog to help others in case they might want to listen. Words have always been a special love for me. I love to read them, I love to hear them, and I love to write them. Words have given me a sense of truth, words have given me a sense of meaning, and words have given me a sense of deliverance from this world. I can no longer read books. I can no longer read anything that is written in the grocery store. I can barely read road signs unless they are in humongous font, like a stop sign. My church where I work has purchased adaptive software so I can read emails and do work on the computer. But last week I had to give up driving. I can no longer struggle with the shadows that are cast in front of me and drive through them without thinking I might hit someone. And while I don’t care what happens to me most times, I certainly care about others who may cross my path. So GRTC has become my friend. Just these last few weeks I have begun to ride the bus to work. I am grateful for the kindness of strangers as I was quite lost those first few trips to the transfer station downtown. I was blessed by a man who works in the Federal Building. I believe his name is Ralph. The first day I got off the bus, he put out his arm and I grabbed hold of it and he gently and kindly walked me across the street to the transfer station. He did it twice. He showed me what bus to get on. I got to work on time. Our brothers and sisters in this world are so kind and when I got lost last week trying to come home, a lady at the transfer station was able to direct me to the right street to pick up the bus. It took me two and a half hours to get home, but that was okay because the whole time I was just grateful. Grateful to the people who surrounded me. I have given up many things that require the use of my eyes. I don’t watch television hardly at all and even when I do I have to sit nearly on top of the TV. Recently I was using binoculars from the other side of the room to see images. I can only watch shows that don’t cut scenes too quickly and where the lighting is good so I can see faces. I can no longer see people and their heads from ten feet away. Even if they sit across from me I cannot see clear sharp images of eyes, noses, and lips. When I go for walks I can see trees and cam hear birds and see the street and still see forms but it’s all very vague now. As I write this, I use a speech-to-text application and I must hold it close to my eyes to see what it is that I am writing. It takes me 20 times longer to write using this application than a keyboard. When I log into my email I have to put my left eye down to the keyboard to see the keys clearly. I have to ask people who they are when they walk toward me. But, I am not fooled by what is happening because I have been lucky enough to stumble upon the greatest book of our lifetimes. Some of you know, that I facilitate a spiritual group every Saturday morning at St Thomas’s Church. I am grateful to be facilitating a group that uses the teaching of A Course in Miracles whose author is Jesus and whose scribe is the late Helen Schucman. We are big enough adults now to recognize that channeled works exist. We are adult enough now to recognize that there is something more happening in this world than just going from meal to meal, Facebook post to Facebook post, and going from day-to-day in our daily habits and rituals. If there is one lesson I can teach people from this process that seems to become a new normal each day, it is this: there is a greater purpose in this life than the things that keep us busy in our minds each day. There is a greater purpose in this life than the things that keep us distracted in our minds everyday. There is a greater purpose in the effects of this world. Our purpose in this world is to forgive it. Our purpose in this world is to see our brothers and sisters as innocent. Our purpose in this world is understand that these bodies we inhabit are not the truth. Our spirit is the only truth there is. And in the Big Blue Book that I study and teach from each Saturday, Jesus is asking us to do two things. He is asking us to teach only love for that is what we are. And he is asking us to forgive our brothers and sisters for what they never did. Our mind is split. We either choose the thought system of fear – the egp. Or we choose the thought system of love – the Holy Spirit. In the Big Blue Book, Jesus is asking us to take our role in the atonement. What this means is he’s asking for us to . . . in our minds . . . forgive this world, these bodies, and every arrogant unloving thought of fear, anxirty, and attack. When we forgive ourselves and each other, we are helping him repair the split mind – the trick of the ego. And let me put this bluntly. The ego made the worold of levels, pain and pleasure, and the body. The body was made as a device to hide from God. The body will never prevail. We exist as spirit . . . as minds. Any sickness in the body is a defense against the truth. My eyes are part of the ego-self. I will say this bluntly, too. I signed up for this lifetime long before I came into this body. Every trick of the ego was my choosing and I have to look at that and repair it in my mind – not in my body. And, I forgive myself for errors that I – in Truth – never made. The only way I can truly forgive and help Jesus and the atonement is to accept my role in it. And my role is to forgive myself and others in my mind and one day the ego will wither and die and we can all go home together. We all go home together because we all landed here together. It’s a done deal. So while my eyes seem to go down the tubes, I realize that my brothers and sisters both known and unknown will show up to assist me. They look like guys who sit on buses and travel to their jobs and who see a person across the aisle who needs help. They are guys like Ralph who don’t know my name but see that the gift of love and help blesses us all. God bless him. God bless all of my students I ever taught. God bless all the readers who have read my books. Jesus chooses his channels wisely…just like you who is now reading this. If you see me in town, please come up and say hi. I might not be able to see you clearly but I will be so glad to have the opportunity to be with you. 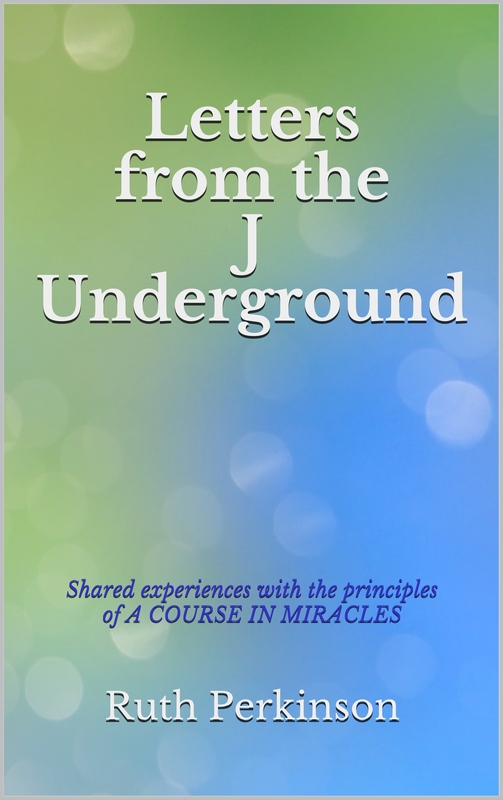 This entry was posted in Blog and tagged A Course in Miracles, Jesus. Bookmark the permalink. 17 Responses to Going blind . . .
You write, “I was gifted for so many years to spread the love …” I hope you realize that you are still gifted to spread the love! Hey Ruth. It’s Karen out in Colorado. Thank you for such a beautiful blog. I am so sorry your eyes have decided to shut down, but I agree with the Course in Miracles and what it can teach. Bless you for sharing your story. Once again, your use of words is making an impact on all of us, just as your books have done. I truly hope whatever modern tools that exist today to help with the loss of vision, find their way to you. If Stephen Hawking can help solve the mysteries of the Universe, then your beautiful mind has no limits either. This journey you chose a long time ago, does shine a light on the path we all travel together. Take care, and keep us up on how things go for you in the future. Wow! Great to see you here…thank you…I love you…can see you clearly in my mind’s eye…remember your kind and loving demeanor. We should connect at some point…would really like that! I’m so sorry you are going through this, Ruth. If I can ever be of assistance, I am right here, breathing with my O2 tanks. I have been retired for several years now, so I am usually available for whatever. You are so kind…thank you! I always thought that I would most regret losing my sight. My rheumatoid arthritis makes writing painful. The blurring of my vision still seems like a greater loss, because I watched my mother gradually lose her sight. We take so much joy in seeing faces, looking into eyes, watching smiles grow. I can feel your joy now, and that’s as good as seeing it, right? My mother lost her sight to macular degeneration. When you can no longer see, touching and hearing become so much more informative. I would soak her feet, trim her bunions and toenails, apply lotion to her legs. I touched my mother as I never did when she could see. I hugged her more, and sat closer to her. Wa at the 20th Tucker reunion. Melissa Crane told me you were losing your vision and she cried! Hey… go to my website and email me from there. It’s so great to hear from you. Love you. Ruth, if you need any help or a ride somewhere give me a call. This touches my heart to read this. I have enjoyed working with you. Please e-mail me and I will give you my personal phone number so that if you ever need anything, you could give me a call. God bless you, my life is better having crossed paths with you.